I am currently exploring a vocabulary of symbols embodying collective and personal history and biological and spiritual identity through sculpture and works on paper. Birth, gender, love, and solitude are always central themes and worthy subjects. The need to say more about internal life, even if it can’t be explained through narrative, remains. Recent sculptures have developed not through careful drawing, but only the quickest of sketches to capture the moment of mental image - vivid yet imprecise. Spontaneity, color, and chance contain limitless potential. The addition of texture and encaustic to finished works on paper reveals their strong relationship to the sculpture. Current materials are accretive, offering resistance and control, accident and simplicity, producing a liaison of painting and sculpture on an intimate scale. 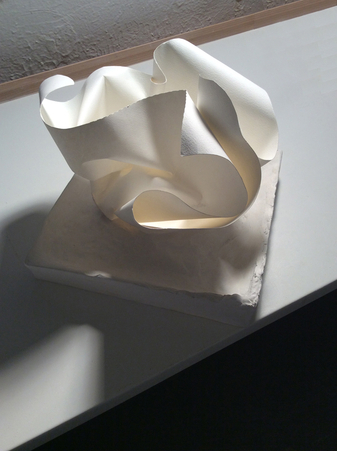 My studio practice employs traditional and non-traditional materials and processes. Media can reflect the location of the studio, now in the garment district, as well the demands of the piece as it evolves. For the cycle to be complete, the finished work is seen by others, because the need for communication and connection has an implicit role in this engagement.